Cheshire Fitness Zone (CFZ) is dedicated to providing children and adolescents of all ages and abilities with therapeutic programs that help them to learn new skills they can use in life. Our main therapy service areas include: physical therapy (PT), occupational therapy (OT) and speech therapy (ST). 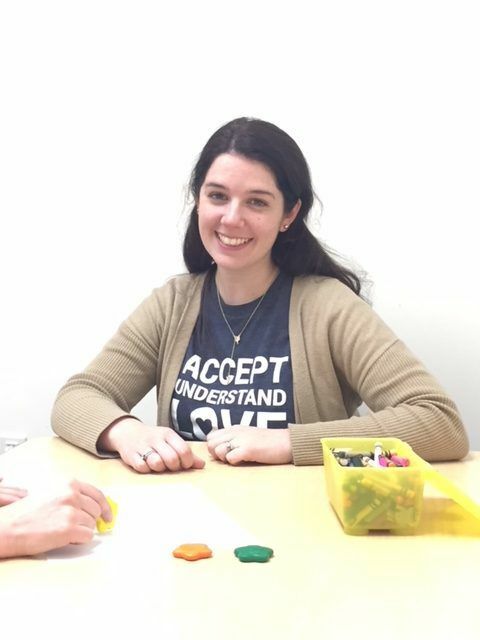 In our Employee Spotlight series, you’ll meet members of our professional staff and get to know more about their experience working with children and what drives their passion. In this spotlight, we spoke to Erin Wells (OTR), a Quinnipiac University graduate who has been working at Cheshire Fitness Zone for the last 3 years. Erin works at a school during the mornings and then travels to the clinic for the afternoon. She describes each day at CFZ as a little different than the next and says she most enjoys being able to work with so many different kids. When I completed my various fieldwork for school, I was exposed to many different occupational therapy (OT) settings. I loved the challenge of working with kids the most because you can’t simply ask them to complete exercises like you can with adults. You have to be creative. In my sessions I use this skill to make sure we get our exercises done and make progress. It’s my goal as an OT to have the kids not even realize they are doing “work” but instead just think that they are playing. I absolutely love working with kids. My favorite part of my job is celebrating the little wins every week with my clients. Anything from stringing a bead independently to tying their shoes for the first time is a celebration that I enjoy. Something else I really love is that I get to be silly and have a lot of fun at work. One of my clients recently referred to me as “the fun doctor” and it was such a compliment to me! I love that the kids see OT as someone who is fun but also helps them. Most days, it doesn’t even feel like a job. What is something you have on your wish list to achieve over the next 10 years? I would like to run the Disney marathon some day! I have done half marathons but it has been hard to find enough time to train for a full marathon. Maybe when my kids are a little older I can squeeze in the training! Professionally, I would like to improve my research skills and eventually complete a study. What are 3 words to best describe you and why? Grateful: I feel extremely lucky to have found a career that I love and have a family that I am so proud of. I also have recently returned to school to get my occupational therapy doctorate degree and having the opportunity to pursue that has been very fulfilling. I am so glad that I found Cheshire Fitness Zone because it is a wonderful place to be a part of. Active: I am active in that I have a lot of different things going on in my life right now, but I definitely feel happiest when I have a lot going on! I have two kids, Eli (3) and Henry (1), am working on my doctorate, teach part time at Quinnipiac and of course I work at Cheshire Fitness Zone. Everyone always tells me that I have a lot going on, but I really do like it that way. I feel very supported by my family and my wonderful colleagues at Cheshire Fitness Zone. Curious: I like to learn! I like to stay up to date on research and I enjoy doing my own research as well. It helps me to be sure that I am doing all that I can to help my clients achieve their goals and be the best OT I can be. Do you have a specialty and/or passion in the pediatric field? I really like working with kids experiencing sensory processing difficulties and coordination difficulties. I use Interactive Metronome at the clinic, which helps some kids with their coordination and timing using a metronome beat. However, I love working with all types of kids and enjoy all that I learn from each new child I work with.